360 Degree Rotating Car Mount Windshield Stand Holder for most phones, iPhones & iPods. 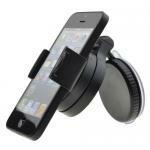 Keep your iPhone away from the windscreen, keep it safe and in view with this dedicated Holder. This cradle mounts your iPhone on your car’s window putting all of your street maps, directions (and more) within view and easily within reach. 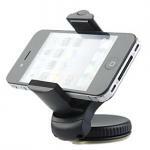 With the cradle’s mounting bracket, it grips your iPhone securely, and allows angle adjustment for easy viewing. A convenient release mechanism lets you easily detach your device when you arrive at your destination; this cradle stays can be locked in position, ready for the next time you use it. Mounting bracket securely holds iPhone with easy access to dock connector and headphone jack. Please can you tell me if the holder will clasp a phone 75mm wide?.. (iPhone 6 + case), thank you. Will this holder take a Motorola Moto G? Thanks H.
Can I use the pad included to fix to my dashboard without damaging anything when I eventually remove it - like, if I want to sell my vehicle? Hi most people fix it to the windscreen. Hi yes this will fit it but sorry we dont have the cases for them. Hi yes you turn the disk and it creates a strong suction on your windscreen.